This is by far the shortest story in the book so far and I encourage you to read it now before scrolling down any further. Eileen Gibbons Kump is the first author we’ve read whose name I don’t think I recognize. I don’t know anything of her bibliography and I’m curious because this story has a decidedly feminist bent and I wonder if this is a recurring theme or not. The story succeeded in getting me to want to yell at and possibly strike the pov’s husband and father-in-law (if the story had been any longer than it was, this might have become unbearable). The way her father-in-law takes over the building of the house and, through his superior wisdom, manages to screw everything up, is horribly frustrating, and imagining living the rest of my life in this wrongly made house just because the patriarch knew better frustrated me plenty. I was reminded of what Zelophehad’s Daughters call the Chicken Patriarchy and I was left wondering how well this story approximates the 2012 experience of being a Mormon woman. Or, on the other hand, if the notion of maintaining sense when denied sayso is exactly what Chicken Patriarchy is all about. In the meantime, you’ve read “Sayso and Sense” now. What do you think? One thing I like about this story is how the quoted portion almost adds it to the just-so-story tradition of explanatory tales. After reading the first couple of pages, I was so angry (on behalf of the POV character) that I had to put the book down and wait for several hours before I could finish the story. The moral of this story (aptly summarized in the paragraph quoted) seems to be that women have to submit to men in the Church (and in life) because men are just too stupid to listen, either to women or to sense, but only to each other. Nothing I can see changes by the end of the story except that the POV character becomes more thoroughly resigned to that. Maybe this is meant to be humorous. But honestly, it made me feel vaguely sick. If I thought that relationships between men and women had to be this way, I would never want to marry. I was left wondering how well this story approximates the 2012 experience of being a Mormon woman. Oh, how well I could tell you of the times as a RS Presidency we have scrapped our grandiose plans on the whim of a Bishop. I could speak of the “approval” we needed for a canoe outing for achievement day girls, the activities scrapped for lack of a priesthood holder to accompany us! And even last night, the church leader who asked my husband to give him access to my personal blog!! I can say that I have felt the exact feelings you felt reading this story as I built my own “house” of Church membership this past 30 years. I wouldn’t characterize this as chicken patriarchy; this strikes me as old-fashioned rooster patriarchy making no pretense of equality. Significantly rarer than it used to be, but far from extinct. For me the most haunting aspect of the story is the way the main character feels a moral imperative to pray away her own experience and judgment. That is the soul-killing aspect of patriarchy and perhaps of all religious hierarchy: the way it can make a subordinate view her own most intimate knowledge of the world as a sin. 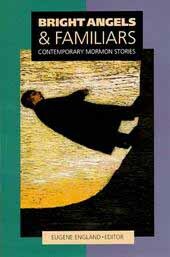 The story comes from a collection of stories, _Bread and Milk_, published by BYU Press in 1979. They follow a Mormon woman through her life. Kump, who was born in 1927, taught creative writing at BYU at some point. She had a story published in BYU Studies in 1960, and stories in The Ensign, Sunstone, and Dialogue in the 70s and 80s. I bet she has stories on the old Relief Society Magazine or other pre-Ensign magazines. The most recent story I know of is from 1997. Here at AMV we talked about another one of the stories from the collection, “The Willows”. Oh, it felt pretty authentic to me. I have experienced nearly identical emotions and thought processes. Thankfully, not within my marriage, but when I was in the Stake RS Presidency and we three would meet with the Stake Presidency and the High Council–16+ men (counting the Stake Clerk and Exec. Secretary) and 3 women–it often felt a LOT like this story feels. I want to read more of her work. I need to find that book Andrew mentions. I can’t help but wonder if reading this story in isolation really does it justice, given what Andrew says about its place in a story cycle. Does the “problem” we are presented in this story finds resolution of some kind later in the cycle? I’d welcome input from someone who has read the whole collection. There is a copy of the book at BYU library if you’re ever in Provo. Perhaps I shall have to find a few hours when I could stop by the library to read it, because I am curious about its place in the cycle. If anyone not in Provo wants to read it, you should investigate your inter-library loan options at your local library. I was thinking the same thing about “The Willows”, Jonathan. I wrote the above before re-reading “Sayso or Sense” and others’ reaction to it and marvel at Andrew Hall’s ability to google what seems at this point like almost arcane esoterica (Kump’s bio) all the way from distant Japan. (Do we need libraries?) And I trust that the rage the story evoked in some of you, including Jonathan, was properly directed at the mentality and behavior of males that has in our time given the title ‘patriarch’ an undeserved bad name and not at its author. (What a compliment to any author!) As one of you surmised, Kump;s collection is like a patchwork quilt, its patches–some sombre, others joyfully effervescent–portraying in tandem the mind and experience of a pioneer woman. With brilliant subtlety and years before the feminist protest in our lifetime — “…he had one of those…voices that didn’t need to shout. And he had an iron gray mustache.” “”the softening voice of intensity, not argument” “Amy sent him to join the adversary” “She smiled at him and he smiled back.” “Inwardly she marveled at how the men in her dream could go about building such a fine coolroom without her objections.” “…she longed to have that trust that made obedience beautiful…that the priesthood could actually carry the burdens without throwing the world into chaos.” — Kump forcefully conveys the plight of almost all women throughout human history. Like Brian Evenson and Neil LaBute, Eileen Kump did not spare us extreme but real cases. We need not question that her separate gems reflect either her own experience or what she had observed or knew about. But unlike Evenson and LaBute, she also provides us with an appropriately balanced array of both shadow and light. And, again, subtly, brilliantly. She deserves being brought to the attention of successive generations of readers. After my wife read your and my foregoing comments, she reminded me that, while as a young woman visiting a neighboring cow town, my grandmother had spied a handsome stranger, her future husband, riding a horse at the head of its Fourth of July parade. Told he was already engaged, she willfully exclaimed, “Not for much longer!” My source? The same dominating, highly opinionated grandma I grew up with. So gender types (and their stereotypes) come from both directions. In a further episode from “Bread and Milk,”, Israel’s similarly despotic treatment of one of their sons augurs a serious breach between them. This is, as I recall, again witnessed through the fairly detached, omniscient eyes of their wife and mother–which makes Israel all the more flawed and real, like you and me. As with the potent stories of our contemporary Chekhov, Alice Munro, we accept that narrative device but should also allow for the way it favors certain characters over others. Finally, isn’t Kump masterful in conveying in far fewer words what for others would require an entire novel? Neither Israel’s, his father’s and my grandfather’s “unrighteous dominion” nor my grandmother’s officiousness were necessarily mandated by the Church, certainly not by God. That’s just how they (we) come. Let’s be clear about that. And maybe they were doing “the best they knew how,” as a recently departed friend so magnanimously put it to me regarding particular brethren, his past tormentors. It does make for dramatic clash and confrontation though, doesn’t it–the ‘spice’ of at least our literary life? I gotta get this book. . . .